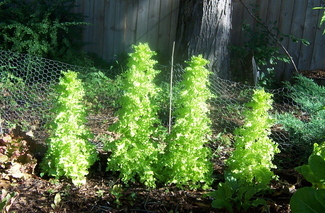 We can bolt lettuce, can we do more than that? The real thing might be a tad messier. The long answer is this. I have always been an eater: good food, cooking, being around kitchens, fun ingredients, etc – bring it on. My grandparents had a wonderful home in Massachusetts with lots of plants, grubs, bare feet days, and summer warmth. In 2006, I started rethinking career – do I want to be in charge, do I want to sit at a desk all day, do I want to live and contribute according to what makes my heart sing and my soul flutter, do I want to feel creative and useful? Yes. Do I want to know where my food comes from? Yes. We started off in Ann Arbor, MI with chickens and a vegetable garden. 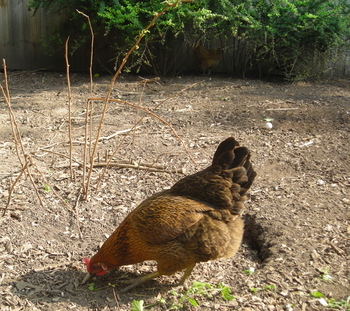 I love keeping chickens, they smell good (I am not kidding, I like to bury my nose in their warm down – they smell like life), the eggs are amazing, killing them is not too horrible, and they are fun to spy on while dust bathing. Vegetable gardens are an exercise in hope and miracles every year – a connection with the seasons and the adamah (humus) that makes up our adam-ness (human-ness). (Thank you Fred Bahnson at TEDxManhattan 2013). One of our girls devouring the last of the raspberries. It was also appealing to be self-sufficient and hone our useful skills, not just continue practicing my consuming skills, but to dive into the nitty gritty homo sapiens survival skills. Finally, there are the niggling doomsday reasons: what if oil goes to $200/barrel and the price of bread goes to $20, etc? When we moved back to the East Coast – this was our chance. Step #1 – find land. I feel very privileged and lucky to have access to resources that made this a very painless process – some of our land was used for hay, some for a woodlot, and some was just overgrown with poison ivy and pin oaks. Step #2 – live on the land. That is where we catch up to the present day. We are in the process of navigating the living part. In order to build a house – we need to clear some trees from the overgrown area. However, I feel a bit like the Lorax – which is what I will address next time. 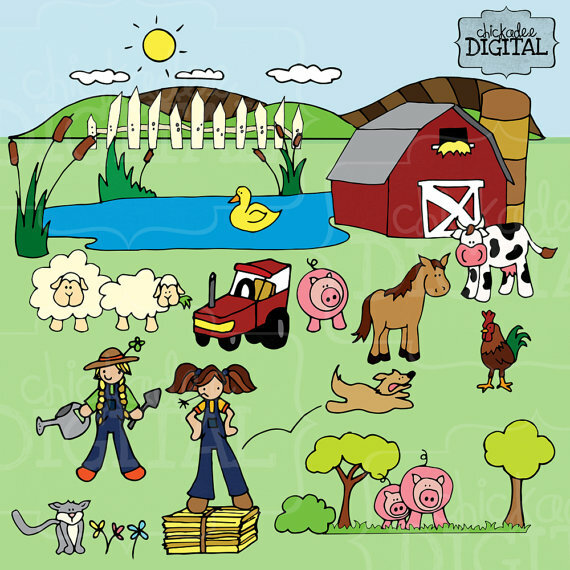 This entry was posted in On the Farm and tagged Corinna Borden, farm, Farm Beginnings, Real Time Farms. Bookmark the permalink. So glad Nastassia! Giggles all around!! Your living the american dream. work on . Thanks so much Wade…so are you my friend, so are you!!! I am going to enjoy hearing about your experiences! We’re on our own farming journey — hoping to buy some land in a year or two. awww thank you… good luck to us both! Hey, nice post. My love of good food is the main reason for me as well to get into farming. I am on this same journey too. Good luck to everyone! Cheers to more and more farming peoples farming!! Thank you thank you Amie!!! I am glad to have found your blog! I teach high school and we are currently working on a unit called The Politics of Food. I am going to share your adventure in Farm-starting with my class! It is very exciting! PS-I LOVE my chickens, as well! Thanks so much for saying hi. I enjoyed reading your April 21st post about the chickens and college – I am laughing because I once taught kiddos about the domestication of plants and animals and had a very similar conversation (and I was an English Major)! So glad to meet a fellow chicken lover! !